CLASS "A" EVP. WANT TO KNOW WHAT WE DISCOVERED? North London Paranormal Investigations has a number of locations we investigate here in the UK. Locations we have been asked to investigate because of our professionalism, Experience and Investigative methods based on science. 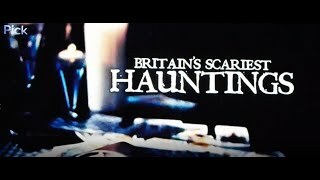 Although most claim to conduct a "Scientific" Paranormal investigation, they have no idea what it means except for "Selling more tickets" for the "Ghost Hunting Events" they organise. Scientific results can be obtained by any piece of equipment. But it is how those results is interpreted, understood and ultimately concluded. To be truly scientific "measures, controls and sterility" is a must as are knowledge and experience. Anything else is just a "guess". 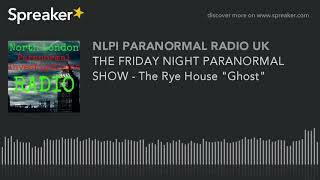 Last year, North London Paranormal Investigations attended a location that we have been to many times previously. We have had several experiences here as a team, most of which have been recorded and documented. The building is owned by the Local Authority and as such we have a Non Disclosure Agreement in place. Publicity is not our goal but research is, so this suits us very well. Having sole permission to investigate this location, which we have done so for several years now, prevents conflicting or exaggerate claims by other teams. EVP or Electronic Voice phenomena, is the capture of voices on magnetic tape using a tape recorder or a Digital Voice Recorder. The voice is not heard at the time by the human ear but is heard upon playback. The clarity of the EVP is labelled as Class "A" for very clear audio and Class "D" for not so clear. On this occasion, a Male and Female Investigator were conducting an EVP session in a remote part of the building. The Female speaks and then the Male asks a question to which a response is heard. We will not offer any suggestions as they do in TV shows, but allow you to make up your own mind with what you hear. We observed the audio in the spectrum analyser and could clearly see the harmonics of both the male and female voice. What we have discovered however, is that the "EVP" response seems to be limited to 220Hz. The voiced speech of a typical adult male will have a fundamental frequency from 85 to 180 Hz, and that of a typical adult female from 165 to 255 Hz. We are very fortunate to have our own Audio Processing Studio and access to some amazing kit. 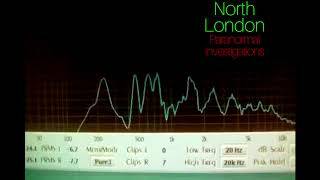 Whenever we analyse EVP we use a Spectrum Analyser so we can "See" the voice patterns. We have experimented with various microphones, including the very same DVR that captured the EVP, Male and Female Volunteers of all ages providing a voice sample for analysis and yet we find it Impossible to reproduce the 220Hz "Voice". Source: https://www.spreaker.com/... Did our Ancestors see Aliens and Flying craft and believe then to be the chariots of the Gods. Tonight Mickey & Cheri talk with The Reverend John Marcus Polk was born in 1969 in Raleigh, North Carolina. He holds a Bachelor of Arts degree in Broadcasting, and another Bachelor of Arts Degree in Metaphysics from the University of Sedona. This university granted john the title of International Metaphysical Minister after his studies were complete. Rev. Polk is also a Reiki Master, and an instructor in Usui Reiki. He is the founder of Wolf Spirit Ministries, LLC. In addition to all of this, Rev. Polk was gifted with the ability to be a channel and a medium. In his book, “Yahweh, The Biblical God, is an Alien” Polk adds his insights into Ancient Alien Theory as a theologian, in the area of exospirituality and how we humans should value our own human experience over what we are told is reality. Who were the people who have elongated skulls? Who build the precisely Engineered Puma Punku which is part of a large temple complex or monument group that is part of the Tiwanaku Site near Tiwanaku, Bolivia. Tiwanaku is significant in Inca traditions because it is believed to be the site where the world was created. Did the Pyramids of Egypt have a technological purpose that has long been forgotten? How did our Ancient Ancestors move and carve huge blocks of stone with precision? 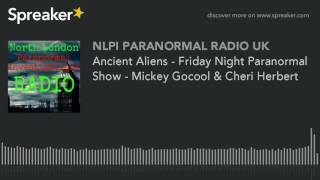 Source: https://www.spreaker.com/... UFOS IN THE UK In December 1980, two members of a US security patrol at an Air Force base in Suffolk went to investigate a suspicious light in nearby Rendlesham Forest. One of the men, Jim Penniston, claimed he saw a strange craft in the woods.“I estimated it to be about three metres tall and about three metres wide at the base,” he said. “I walked right up to it. I noticed the fabric of the shell was more like a smooth, opaque, black glass.” The object then apparently vanished, but other staff at the base noticed some strange sights over the next few days. 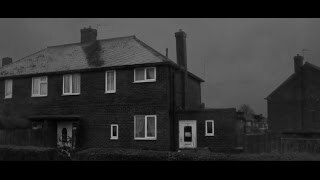 Former British cop Alan Godfrey believes he was the victim of an alien abduction when he was on a night patrol in November 1980. The respected policeman was suddenly startled by a brightly lit craft on the road in front of him, which he claimed was “the size of a bus. ”The UFO was 14ft tall, rotating and hovering five feet above the ground, but when the creeped-out cop tried to radio for help, Pc Godfrey found his device was dead. The next thing remembered was driving along the road again 30 yards beyond the point where he was stopped. In 1990, two hikers in the Scottish Highlands were startled when a huge diamond-shaped object appeared in the air, where it hovered for 10 minutes before shooting off into the sky. Whilst most UFO ‘sightings’ lack convincing photo evidence, these savvy spotters managed to snap the mysterious craft. A series of 6 colour photos showed the 25-metre metallic craft with an RAF jet in pursuit, and the pictures were said to be the best ever evidence of UFO activity. 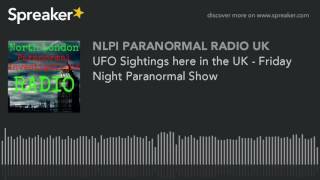 North London Paranormal investigations are a team of Paranormal Investigators based in North London, UK. These are some of their investigations.